Joy Creek Photo Archive (c) all rights reserved This is a medium-sized evergreen shrub with fairly long tapering leaves measuring 2 1/2 inches long and 5/8 inches wide. The three-inch inflorescence is composed of tiny flowers that have white tubes, a very pale violet blush at the mouth and violet anther tips. 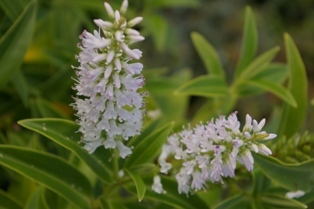 We detect a fresh fragrance but no obvious sweetness in the showy flower spike of Hebe stricta var. lata. August to autumn. 30 in. x 30 in.